Clubhouse with changing rooms, bar, restaurant and lounge. Pro shop with buggy and trolley hire and practice facilities on-site. Resort also has spa and swimming facilities. Just like a huge verdant garden, homes, facilities and services are set out tastefully beside the course, creating an extraordinarily beautiful landscape right by the sea. With its indigenous species of vegetation and the green of its fairways and greens the course seems like a visual continuation of the gardens. The course has been designed to challenge and reward golfers of all levels and boasts an original design, with natural and man-made hazards that provide an added challenge to each round. 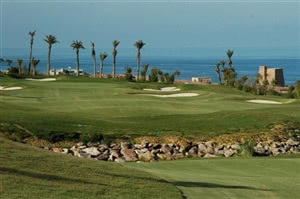 The sea views are yet another attraction, making for an unforgettable golfing experience.